CHANDIGARH: Battling shootouts and arresting armed suspects may be the deadliest part of police duty but what cops in the city fear the most is the silent killer. Stress has claimed the lives of 135 out of 204 cops of the ranks from constable to inspectors from January 1, 2010, to March 31, 2019, according to information sought under the RTI Act. The application was filed by a head constable of the UT police department. The RTI reply said the 135 cops died due to stress-related diseases like high blood pressure and high sugar and cardiac arrest. Eighteen cops died due to cardiac arrest, while 11 had committed suicide. These deaths were not included in the stress category in the RTI reply. Police work may appear routine, but it can be full of dangerous and stressful occurrences. With little warning, cops may find themselves thrust into events ranging from domestic disturbances to natural disasters or terrorist acts. Dealing with such explosive situations day after day, only pushes up stress levels and leads to possible biological consequences. So it’s important that cops get psychological support at the right time. It’s time that police departments paid attention to their officers’ emotional and physical well-being by giving them timely offs. Mapping their stress levels and getting them to de-stress through activities like yoga, nature walks and dancing may be a good idea. Although the police department conducts medical examination of cops at its hospital in Sector 26 police lines every year, it has not maintained a record of those suffering from the diseases. In the RTI reply, the police department claimed only four cops have a heart problem, 120 are suffering from hypertension and 47 are diabetics. Obesity is another worry area for the police department. According to the data, 381 cops were diagnosed with obesity but surprisingly, the department has no information of cops suffering from asthma, low blood pressure and kidney-related problem. Charanjit Singh, DSP, PRO, UT, said police have taken several measures to keep cops stress-free. Recently, 300 cops attended a nature walk exercise. Another initiative taken by the department is green police stations. “Under it, officials in police stations are involved in nurturing plants on the police station premises. Going close to nature are also a great stress-busters,” the DSP said. The police department also trained 40 cops in wildlife photography under green police initiative. A batch of cops will attend a course in mediation in the last week of this month. 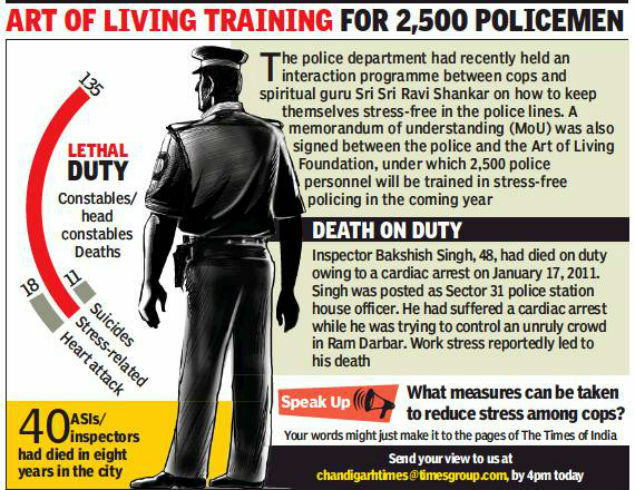 While the Chandigarh Police have the best police-public ratio in the country, a number of constables and head constables complained long working hours and absence of weekly offs have led to stress-related diseases. The United Nations has recommended that if any state has a ratio of 222 cops per lakh population, working hours of cops can be reduced to eight hours and they can easily get their weekly off. The city has near 630 cops per lakh population. But cops deployed at police stations have been complaining that they are getting their weekly off after 15 days and are working for 12 hours or more regularly in a day. According to data, the city has 6,300 cops for 114 square km area and a population of over 11 lakh. Experts said long-working hours affect the morale, raise stress level, cause irritation, and lead to behavioural changes. Rude behaviour of cops also causes gap between police and public. As per data available, 2,435 complaints against cops have been received by senior officers from January 1, 2016 to December 2018.